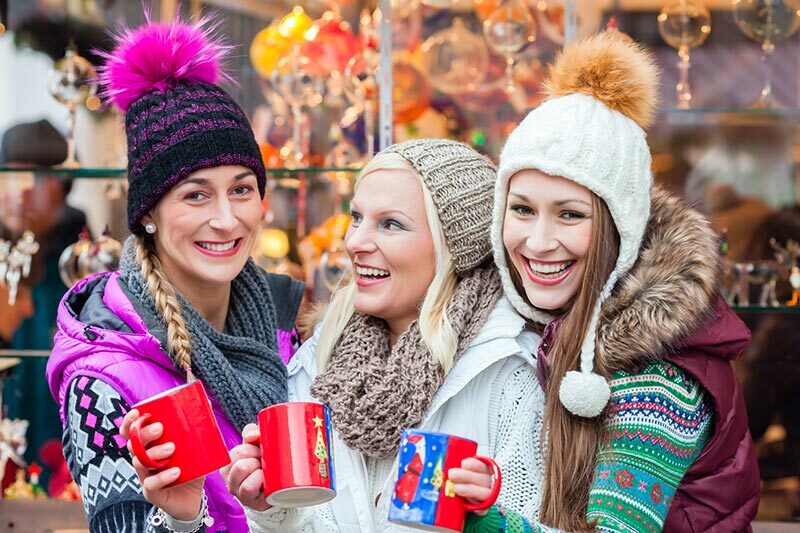 No German Christmas market is complete without “Glühwein,” the hot, spiced mulled wine that warms holiday merrymakers from the inside out as they stroll through these charming little villages of cloth and wood with family and friends. Glühwein is usually prepared from red wine, which is heated up and spiced with cinnamon sticks, cloves, star anise, orange juice plus zest and sugar, as well as – albeit more rarely – with vanilla pods. Sometimes it is also drunk “mit Schuss” (with a shot), which means that a shot of rum or another liquor has been added. The expression “Glühwein,” or “glowing wine” apparently stems from the hot irons once used for mulling. Although this is no longer the case today, the historic origins of Glühwein reportedly date back to when wine started going bad, but thrifty folks did not yet want to throw it out, so they added some honey and spices to make it drinkable again. Today, the beverage is popular in German-speaking, as well as in the Alsace region of France and many other parts of northern Europe. The oldest documented Glühwein tankard is attributed to Count John IV of Katzenelnbogen, a German nobleman who was purportedly the first grower of Riesling grapes. His gold-plated lockable silver tankard ist dated to about 1420. Glühwein can be enjoyed with “Lebkuchen,” the chewy spice cakes perfected centuries ago in Nuremberg and popular all over Germany, or all manner of other treats served up at traditional German Christmas markets, including roasted nuts like “gebrannte Mandeln” (burnt almonds), “Reibekuchen” (potato pancakes), or “Stollen,” a dense, marzipan-infused fruit cake masterminded by Dresden-based bakers. Or you could just enjoy your Glüwein with a piping hot bratwurst. Another popular variant of Glühwein in Germany is the “Feuerzangenbowle.” Popular on New Year’s Eve, it shares the same recipe, but for this drink a rum-soaked, cone-shaped sugar loaf (sugar cone) is set on fire and allowed to drip into the wine. But the Glühwein most commonly sold at seasonal Christmas markets is made with red wine. Luckily everyone is on foot in the narrow “streets” criss-crossing these cozy markets set up on town squares, given that indulging in several glasses of Glühwein could result in some wobbly walking, at least until the next tasty seasonal snack is consumed to help soak up all of that Glühwein goodness! Combine wine and sugar in a pot to heat, but do not boil the wine. Stick cloves into one half of the oranges (this way you will not have to fish out the cloves separately later). Add them to the heated wine. Next, add the cinnamon sticks and the rest of the oranges (sliced). Simmer for 10 minutes. Serves three. Editor’s note: This article is reprinted with permission from the German Missions in the United States (German Embassy), from their website: www.germany.info.